Larry Kaufman on the new Komodo 12: The playing strength of the regular Komodo engine is only represents a gain of about thirty Elo points over Komodo 11. The playing strength in MCTS mode, running on one thread, is well over 3000 Elo, which is stronger than any other PC engine in the world. On two or three threads Komodo 12 will gain roughly the same amount as normal engines do, which is roughly fifty Elo for two threads and about eighty for three. Big news: the Komodo 12 package includes a working Monte Carlo Tree Search (MCTS) option, which allows Komodo to use MCTS in place of the normal alpha-beta search, while still allowing the user to play games, to analyze, and pretty much to do the same things he would do with normal Komodo. But it has the characteristic behavior of AlphaZero and Leela in that it is less materialistic and more aggressive (and human like) than normal engines. Komodo MCTS has some real advantages over the normal Komodo engine. First of all, if you want to look at the evaluations of many (or in fact all) legal moves at the root, Komodo MCTS will not lose strength while displaying this information. Regular chess engines lose hundreds of Elo points when displaying multiple lines. The playing style of Komodo MCTS is far bolder than that of the regular engine. It plays much like AlphaZero, preferring activity to material (within reason). The moves tend to be more human, because MCTS doesn't assume perfect play by the opponent. Finally, the evaluations change more gradually, not in sudden jumps as is typical with normal engines. 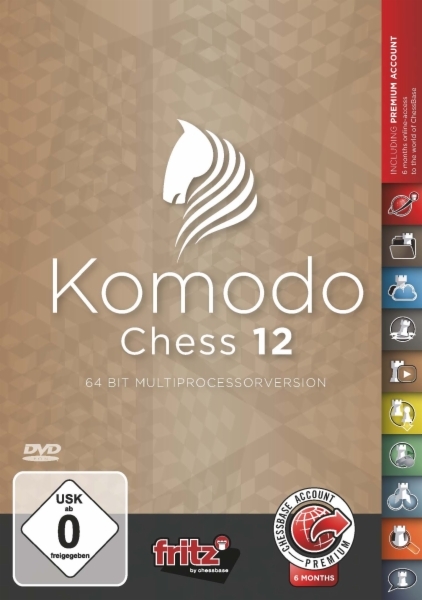 Komodo 12 has additional skill levels, now 0 thru 20, to allow players to face an opponent of comparable strength. Level 0 is roughly beginner level, level 19 perhaps Magnus Carlsen level in quick games, and level 20 is the full strength. Find your matching level and practice against the computer.